In many of our posts, you may notice a map with various places, hikes, restaurants, etc. pinned. We want you to be able to take these places with you on your journey, so we’ve decided to make this instructional post to show you how. Step 1: Download MAPS.ME app (available for iPhone and Android). This map has been unbelievably useful to us throughout our travels. All you need to do is download the map of the area you’re traveling to before your trip. Then you can access all you need offline—including directions, popular places, and even trails! After having too many issues using Google Maps offline, we switched to MAPS.ME and have found it so much easier to solve issues on the fly, such as “Where’s the nearest supermarket?” or “Where are we on the hiking trail?” Anyways, we couldn’t recommend this app enough for the frequent traveler. You can download the app from your app store or at their website. Step 2: Download the map of the area you’ll be traveling to. This is usually done be zooming into the country. The app should prompt you to download the map needed. Step 3: Open our blog and go to the map you’d like to download. 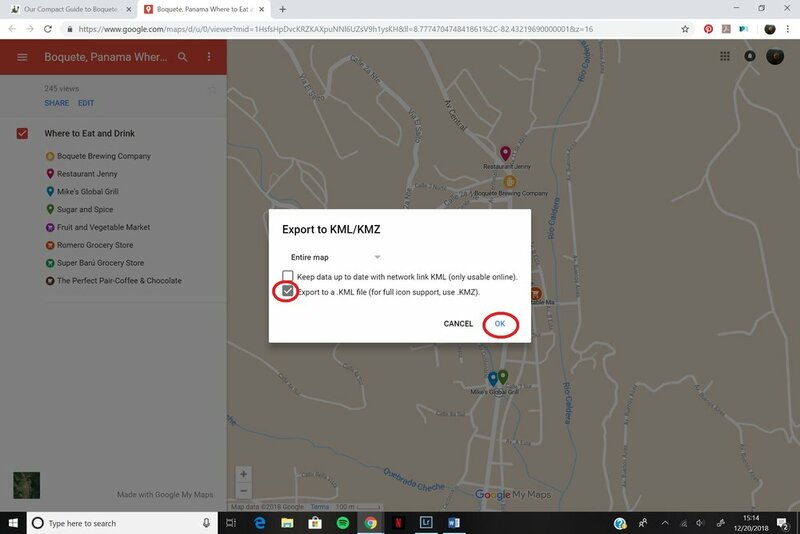 Click the enlarge map button circled in red below on the screenshot. Step 4: The map will open in another tab. In the upper left corner, on the right side of the map title click on the 3 vertically stacked dots (circled in black below). Step 5: Select “Download KML” circled in red below. Step 6: Check the box for “Export to a .KML file (for full icon support, use .KMZ).” Click OK. Step 7: The KML file will download onto your computer. You will need to find the folder where the file is downloaded. Step 8: Email yourself a message with the KML file attached. Step 9: MAPS.ME website has a great instructional page for how to open KML files onto the app itself. The page shows how to do it using both iPhone and Android phones. You can find the page by clicking here. That’s it! If you ever have any questions, feel free to email us at nomadicwilhockis@gmail.com or comment below!